This reports provides a general description of the Ilisu Dam and Hydroelectric Powerplant Project and of its current state of implementation. It also gives an overview of the long fight of local, regional and international campaigns to stop the Ilisu Project, one of the most controversial dams worldwide as it would lead to grave social, cultural and ecological impacts in a larger region. The Ilisu Project on the river Tigris is the largest hydroelectric power plant planned or under construction by the Turkish government. Initiated in 1997, it is a key part of the large scale ‘Southeastern Anatolia Project’ (GAP), in the mainly Kurdish populated southeast of the Republic of Turkey. GAP consists of 22 large dams with a capacity of 8000 MW/h and the planned irrigation of 1.8 Mio. Ha. land. The 1,200 MW and 2 bin Euro project with a height of 138 m would flood the Tigris on a stretch of 136 km and an area of 313 km². The first Ilisu Consortium collapsed in 2002, but was revived in 2005 with the involvement of German, Swiss and Austrian companies which applied for export credit guarantees in their states. In the following years, the involvement of European companies, banks and governments was highly contested until, in July 2009, the Export Credit Agencies (ECA) of Germany, Austria and Switzerland made an unprecedented step by suspending the credit guarantees due to the Turkish failure to comply with required environmental, social and cultural heritage conditions. However, the Turkish state and the Ilisu consortium organized new financing and started the construction of the project in 2010. The planned Ilisu dam reservoir would completely or partially flood 199 villages and the ancient city of Hasankeyf, which are home to up to 78,000 people. Additionally up to 3,000 nomadic families would suffer directly. The vast majority is Kurdish, while half Hasankeyf’s population is Arabic, and until the genocide of the 20th century an important part of Hasankeyf and some villages were Syriac. Almost half of the affected people do not own and would not get any compensation. For the other small villagers there is neither land for resettlement nor are there other income compensation measures that have been set in place as yet. The affected people face the loss of their livelihoods and history, the disruption of their village and family structures and a future in extreme poverty in cities. The Turkish government’s centralistic behavior has no space for any participation for the affected people, civil organizations and affected municipalities. Everything has been planned in Ankara by the DSI (State Water Works), the project owner on behalf of the Turkish government. The Ilisu project is situated in Upper Mesopotamia, the “cradle of civilization”, where the first human settlements developed. The Ilisu Project would affect up to 400 archaeological sites – the whole affected area has not yet been surveyed completely. To date only in around 20 sites excavations have been done. The 12,000 year old town of Hasankeyf that uniquely merges a rich and historic cultural heritage with an important biologically diverse environment would be flooded by the Ilisu reservoir. That is why it became the symbol of the struggle against the Ilisu Project. Hasankeyf was on the Silk Road for centuries, one of the largest cities in medieval times and includes traces of 20 different eastern and western cultures, several hundreds of monuments and up to 5,500 human-made caves. It is a large area and needs careful excavation for dozens of years. Hasankeyf and the surrounding Tigris Valley fulfill nine out of ten UNESCO world heritage criteria according to independent expert research1, but no application to list the site has been done by the Turkish government. Rather the fact that Hasankeyf is declared a First Degree Archaeological Site by Turkey’s Supreme Board of Monuments in 1978, is used by the government to impede any development or investment for planned and sustainable tourism. The Ilisu Project is a large intervention into the geography of Upper Mesopotamia and would flood 400 km of precious riverine habitat which is home for many species like the endangered Euphrates Soft-shelled Turtle. The river stretches are very crucial for the whole ecology of the region. The regional climate would also change as happened with the Euphrates River Basin where the traditional agriculture experienced some serious negative impacts due to four large dams. As only some research has been done in the Tigris Valley up to the present time we do not know really what would be lost. The water quality of the reservoir is expected to be extremely low, leading to massive fish extermination, and threatening people’s health. 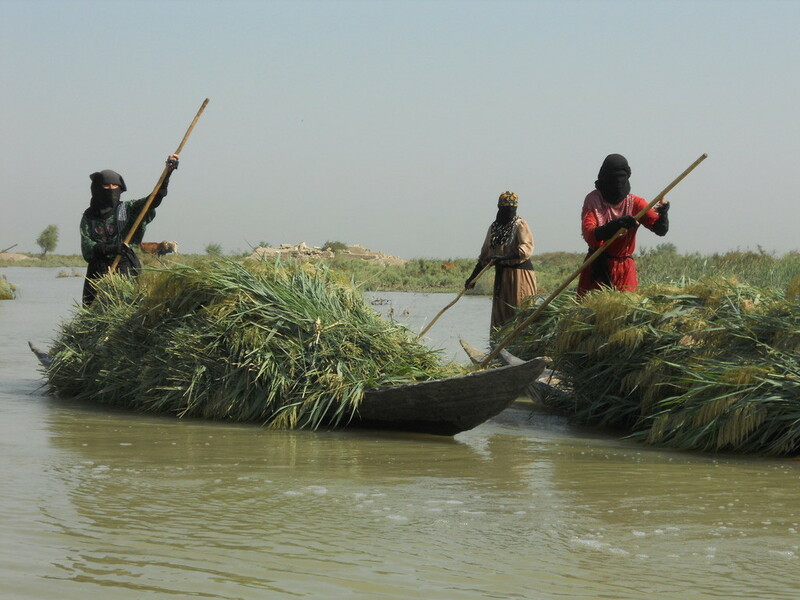 Further downstream the decreased water flow will have a negative effect upon the Mesopotamian Marshes in Iraq – one of the most important ecosystems worldwide and recently proposed by the Iraqi government as a UNESCO World Heritage Site. Syria and particularly Iraq rely on the water of the Tigris River, which is the vital source for agriculture and water supply to urban centres. The storage capacity of the Ilisu reservoir could stop the flow of the Tigris to Iraq for months and would gravely violate the right to water for downstream riparian people. International conventions and law require mutual agreements between Turkey, Iraq and Syria; but Turkey has not signed the most important convention in this field. How Turkey uses dams as a weapon can be determined currently in the case of territories of the Democratic Federation of Northern Syrian liberated by the Syrian Democratic Forces (SDF): in spring and summer of 2017, Turkey has cut the Euphrates almost completely which stopped power generation and decreased the drinking water supply for half a million people. Turkey thus violated an agreement signed in 1987 in which it committed to release at least 500 m3/s at the border with which it had largely complied with until the SDF liberated the two Euphrates dams Tishrin (Dec. 2015) and Tabqa (April 2017). Four Turkish companies (mainly Cengiz and Nurol) and the hydro-power company Andritz from Austria as the consortium leader received credits from three Turkish banks: the public Halkbank and the private Akbank and Garantibank. It is assumed that the Turkish government has taken the role of the export credit agencies and covers the financial risks. The campaign against the two private banks in 2010 was the first bank campaign conducted by civil society against Turkish banks, but was not successful in changing their support for the dam project. In the summer of 2010, the construction of New-Hasankeyf, a new town located 2 km north of Hasankeyf, has started. In the summer of 2012, the three tunnels for the diversion of the Tigris were completed and the conditions for beginning the construction of the dam body were fulfilled. In January of 2013, the administrative court of Ankara decided to halt the Ilisu Project until the missing Environmental Impact Assessment was conducted. The government however changed the laws in such a way that after three months the construction continued. In the summer of 2014, the PKK Guerrilla kidnapped two heads of the workers companies, which stopped the construction for five months. In June of 2015, the workers organized a strike after they had been attacked by security forces of the companies during negotiations on their working conditions, which lasted until November 2015. The renewed armed conflict in the Kurdistan region of Turkey allowed the government to suppress all forms of protests. 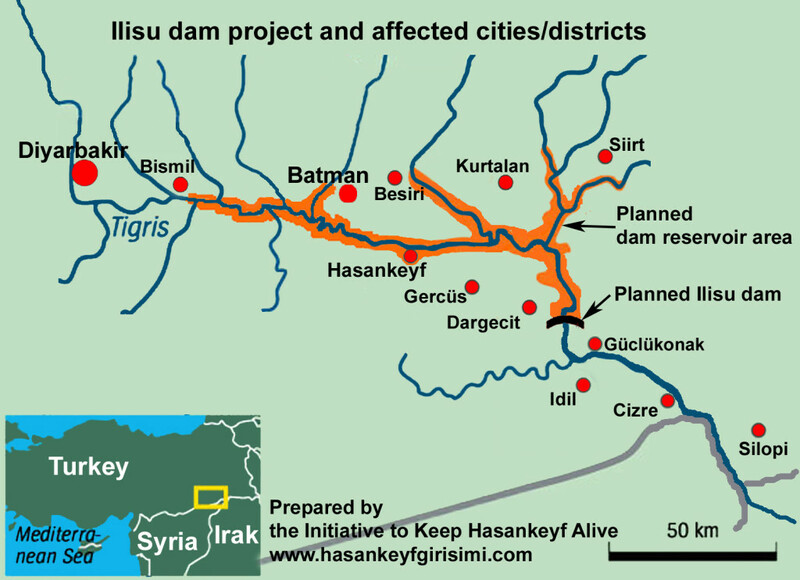 The increased repression also limited the campaign against the Ilisu Project, which was revived in 2015 by the HYG and Mesopotamian Ecology Movement and had its peak in the first Global Hasankeyf Action Day on Sept. 20, 2015. Since the end of 2015, the vast majority of the workers comes from far away provinces , lives at the construction site and has no connection to the local people. The government employed hundreds of additional people as ‘village guards’, paid and armed them for the ‘security’ of the Ilisu Dam site which is situated close to areas contested since the 1980’ies between the Turkish Army and the Kurdish PKK Guerrilla. Thousands of ‘security forces’ around the dam site are involved in the ongoing military operations and are faced with some small PKK attacks since the end of 2015. The militarization has reached such a level that it has become impossible to visit the site as independent researcher. The state of emergency declared in July 2016 has made it almost impossible to express critic via manifestations or other actions in the public. Throughout 2017, areas around Hasankeyf have been declared as military areas by the government. In 2017, DSI and government officials announced several times that the resettlement of Hasankeyf residents will be done in 2018 and the flooding will start at the end of 2018 or the beginning of 2019. In August 2017, the Turkish Minister for Forests and Water, Veysel Eroglu, stated that the Ilisu Project had achieved 97% completion2. Critics doubt this as the hydroelectric power plant is still not completed; the large bridge near Hasankeyf (crucial for the traffic of the whole region) and many roads in the areas to be flooded are still under construction; and the expropriation of hundreds of affected households as well as the construction of New-Hasankeyf still continue. The Turkish government has declared several times that Iraq would not suffer when the flooding of the dam reservoir takes place3. However, until now only 60 m3/s are promised for the flooding period of 6 to 24 months which is very low considering that the average flow is around 500 m3/s at the Turkish-Iraqi border. In order to pacify Iraqi government protests, Turkish ministers have met Iraqi ministers several times, most recently in March 20174. While the construction of the Ilisu project officially costs 1.2 Billion Euros, the resettlement (expropriation, resettlement, new infrastructure etc.) roughly requires another 800 Million Euros. The expropriation in the 200 affected settlements started mainly in 2012. Apart from the Ilisu village, resettled in October 2010, and Hasankeyf there is no planned resettlement. All other people get cash and select their new residence. In 2017, there are still between one hundred and a few hundred households which have not accepted the proposed compensation amount and have appealed the court. Particularly several dozen people in Hasankeyf and the village Suceken resist the expropriation. In Hasankeyf, in 2012 and 2013, the population twice organized demonstrations for their rights in the resettlement process. The DSI declared that at the end of 2017, the first group of new apartments will be handed over to the residents, but they claim that the quality of the buildings is very low and already now the deficiencies can be observed at the buildings. 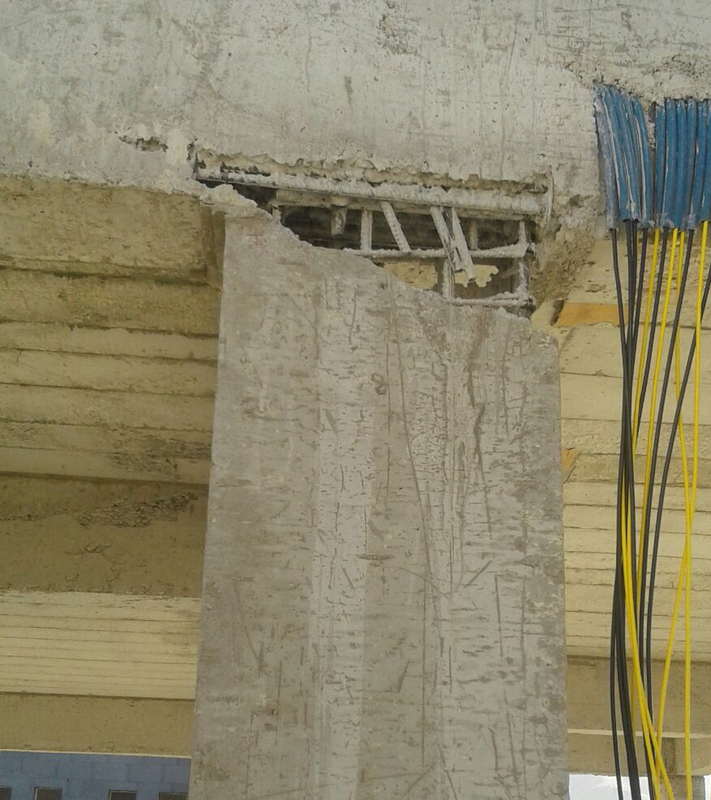 The concerned residents state that the reason for these damages is the high speed of the construction. It seems that with the poor construction the risks for the people, who will move to New-Hasankeyf, will raise significantly. The significance of the cultural heritage of the region largely stems from in the unique natural environment in which it resides. For many years the Turkish government claimed that with the creation of a Cultural Park adjacent to New-Hasankeyf, the cultural heritage of Hasankeyf would be rescued. The activities of the last two years have clearly revealed however that this claim was nothing but empty words. In 2015, the three pillars of the antique bridge over the Tigris was started to be covered with new stones. This has been described as a restoration and conservation measure for when they will be submerged under water. Rather it is an irreparable change of the surface of the bridge. 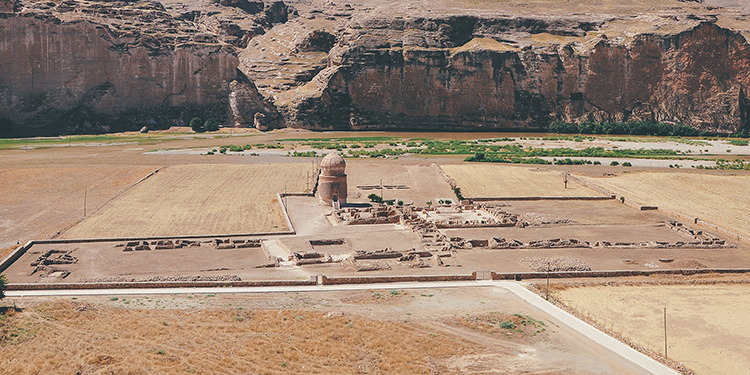 According to DSI, in total nine monuments are planned to be relocated to the planned ‘Hasankeyf Cultural Park’. The preparation for the relocation of the first one, the Zeynel Bey Tomb, started in 2015. The whole process of the relocation was hidden from the public and had no participation by stakeholders, violating existing laws, particularly the tendering and contracting process. With the participation of the Dutch company Bresser Eurasia, the Turkish Er-Bu Insaat could finally relocate the Zeynel Bey Tomb on May 12, 2017. Considering that there is globally no similar relocation experience of a monument of such an age (550 years old) with binding agent technology and the monument is very fragile and in poor condition (there are splits in the cupola) it was a very risky action. People in Hasankeyf stated days later that there was an increase of cracks at the surface; but as no independant experts could examine the monument it is unclear what the result is. A new step in the physical intervention and destruction of the cultural heritage of Hasankeyf has started around August 10, 2017. The DSI commissioned a company with the work of demolishing many of the human-carved rocks using explosives. Bringing down rocks from the Castle Rock and its surrounding valley has started with the official aim to consolidate them for the time after the planned impounding of the dam reservoir and subsequent development of tourism. Other planned measures are the filling of 210 human-carved caves in the rock castle area as well as the construction of concrete walls of a hundred meters length around the Castle Rock, which would stick out from the planned dam reservoir. This destruction, documented by videos and pictures, has sparked ire from people and organizations from the region and all over Turkey7. Because of broad public criticism, the governor of Batman province and DSI stated that no explosives have been used and the objective is to protect civilians from falling rocks. Locals confirmed however that only a minor part of the rocks were removed without explosives. 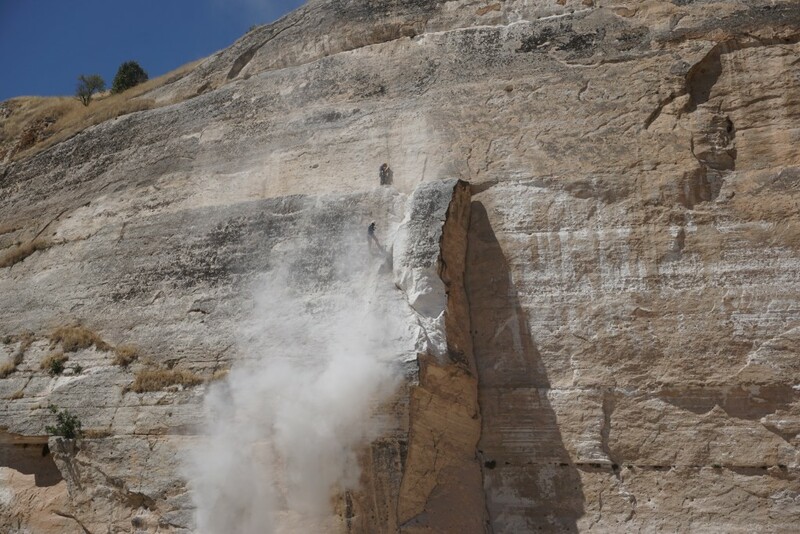 And an incident seven years ago, when a falling rock in Hasankeyf killed one person, happened after recent prior human impacts and missing protective measures by the Ministry for Culture. Furthermore locals stated that the explosives created fear among the population of Hasankeyf, particularly children. They hold that the alleged ‘constituting danger by rocks’ has the real aim to drive out the people and artisans of Hasankeyf and particularly to have enough debris for the planned ‘antique’ harbour which would be central for the planned tourism of the Castle Rock. It is cheaper to bring down material than to transport it from areas far away. Thousands of years of human ingenuity is being destroyed for a short-lived power project. Another scandal in this regard is that only several days after the destruction of rocks an officially required permission was issued (on 15.08.2017) by the Regional Board on the Conservation of Cultural Assets. So at least some of the rock demolitions were illegal. In the first days of September 2017, construction companies started to work with the debris from rock destruction. Founded in January 2006, the Initiative to Keep Hasankeyf Alive (HYG) currently brings together a coalition of 88 organisations: Activists, local ecological, cultural, women and human rights non-governmental organizations (NGOs), professional associations, trade unions and affected municipalities. The aim is to stop the Ilisu Project and pursue the aim of improving the socio-economic situation of the locals, developing the cultural heritage and saving the nature through the direct and democratic input of all relevant stakeholders at all stages. Since the first days of its foundation, the initiative has worked on different dimensions like informing affected people, public actions, camps, conferences, surveys, reports, trials and coalitions with other civil society organizations in Turkey and abroad. In 2015, the activities were, but the ongoing war has limited actions and impacts. The initiative is the longest and strongest campaign against the Ilisu Project. Between 2007 and 2013, the Istanbul based environmental organization ‘Doga Dernegi’ (www.dogadernegi.org) carried out a strong campaign. For several years, the campaign could achieve serious interest, also in Western Turkey,and contributed to the withdrawal of the European export credit agencies. In 2009, the famous Turkish singer Tarkan joined some activities for Hasankeyf and in 2012/2013 dam activists from Brazil and South Iraq came to Hasankeyf and Ilisu in order to join activities and protests. Between 2006 and 2010, there was a strong cooperation between the organizations in Turkey and a number of organizations in Europe, mainly organized as the Ilisu Dam Campaign (www.stopilisu.com), particularly targeting the European financing of the Ilisu project. In at least six states of Europe several action days were organized against the governments, banks or companies with the involvement of dozens of civil organizations and hundreds of people. The media coverage was high over several years. 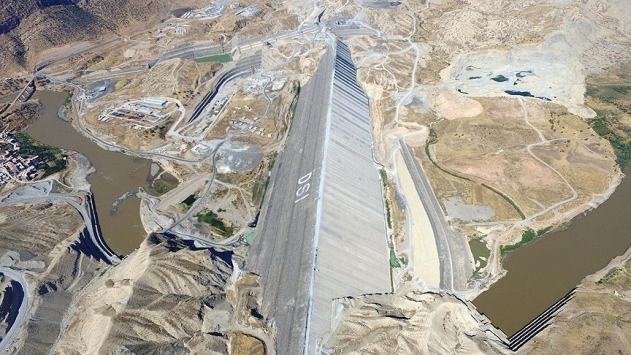 Between 2009 and 2011, there were several initiatives, which the HYG joined, to form a Turkey wide coalition on dams, rivers and water of local struggles. Several common demonstrations were organized in Ankara and Istanbul and common actions days have been initiated. Since 2012, Hasankeyf Matters (www.hasankeyfmatters.com), a group of volunteers from Istanbul and Batman, is involved in the campaign. It focuses on the conservation of the cultural heritage of Hasankeyf. 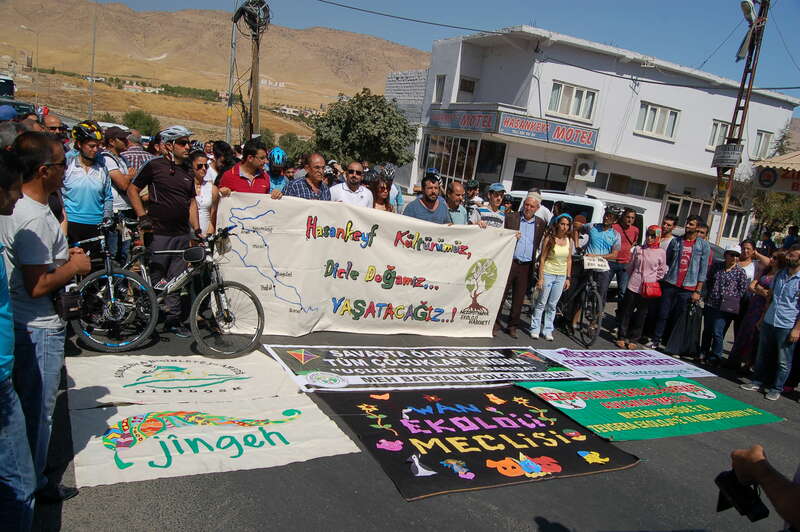 In 2015, the recently organized Mesopotamian Ecology Movement, a broad movement of ecological oriented activists and organizations in Turkish-Kurdistan, joined the campaign against the Ilisu Project. In 2015 only, more than five demonstrations were organized together with the HYG, two of them in Dargecit, the town next to the dam site. On September 20, 2015 the 1st Global Hasankeyf Action day was organized.11 The 2nd Global Action Day will take place on September 23, 2017. In March 2016, with the important role of Hasankeyf Matters and the support of the Initiative to Keep Hasankeyf Alive, Europa Nostra selected Hasankeyf as one of the 7 threatened cultural sites of Europe. In May 2016, an international symposium was organized in Batman by the members of the Initiative to Keep Hasankeyf Alive. Apart from raising public interest, the discussions centered around the questions whether and how the struggle can be intensivated and how an UNESCO process could be initiated. Both this initiative and the Europa Nostra process came to a standstill when in July 2016 the state of emergency was declared in Turkey just after the failed military coup. In the days after the military coup attempt in July 2016, a counterforum meeting was organized by dozens of civil organizations (including HYG) in Istanbul where the UNESCO World Heritage Committee (WHC) held its 40th session. Critic was raised in a state where the state systematically destroys cultural and natural heritage.12 Paradoxically, at the 40th Unesco WHC Session the Marshlands in South Iraq were inscribed on the UNESCO World Heritage List without questioning the Ilisu Project which would cease dramatically the water flow to the Marshlands, the biggest wetland in the Middle East. In spring 2017, in Iran several environmental groups started a signature campaign directed to the UN General Secretary with the request to act against the Ilisu Project13. The petition brings forth the argument that the drying out of the marshes in South Iraq will increase the sand storms in South Iran which increased in the last three years and has as yet not been considered much in the whole discussion about water and dam construction. On June 28, 2017 several organizations based in the Netherlands and the Initiative to Keep Hasankeyf Alive conducted a protest against the Dutch company Bresser at its headquarter close to Rotterdam14. 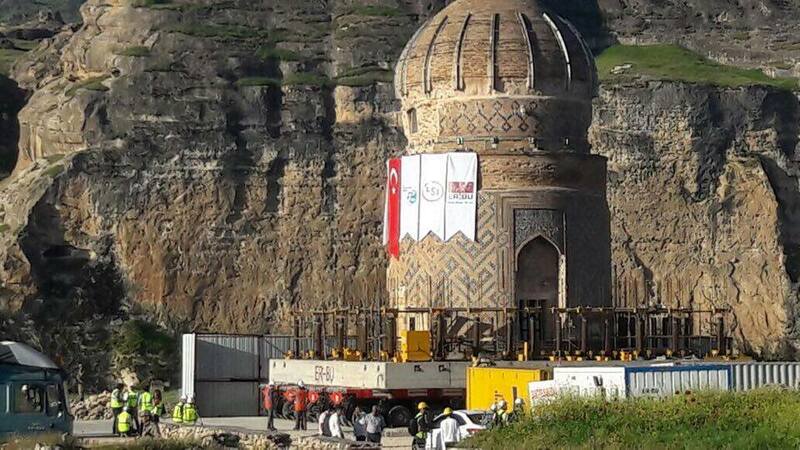 Bresser is crucial in the relocation process of up to nine monuments in Hasankeyf, as the skills of Turkish companies are not sufficient. After the destruction of rocks in Hasankeyf in August 2017, the Kurdish and democratic Turkish media broadly highlighted the destruction in Hasankeyf. Also the international press noticeably published the recent developments. The HDP deputy of Batman province, Mehmet Ali Aslan, did an act of protest by chaining himself to rocks in the area of destruction over two days. On September 9, 2017 in Istanbul 39 civil organizations did a manifestation; they stated the foundation of the “Volunteers of Hasankeyf” and announced an increase of the struggle against the Ilisu Project. Since 1999, a number of court trials have been initiated against the Ilisu Project. None were successful in canceling the Ilisu Project and almost all have been completed. Within Turkey the first large trial started in 1999 and included the right of access to cultural heritage. It came to an end just in 2010 and allowed the continuation of the project based on the reason that Ilisu is a project of high public interest although significant cultural heritage may be damaged. Another legal process was issued by the Union of Chambers of Engineers and Architects (TMMOB) because of the lack of an Environmental Impact Assessment (EIA). After some achievements in some trials, the administrative court of Ankara decided to halt Ilisu due to the lack of an EIA. The government has not complied with this ruling though. Several small lawsuits have been filed by locals contesting the expropriation of their lands on grounds of state of emergency, which became the standard for Ilisu. In 2015, suits were filed against a decree on the planned relocation of the people of Hasankeyf. It led to a new and partly improved decree. In 2016, the complaint against the relocation of the Zeynel Bey Tomb was rejected within a few months. Since 2006, a complaint at the European Court for Human Rights (ECHR) by four individuals is in process. In 2015, nine years later, the case of Hasankeyf has been accepted as an urgent case. However, until now no decision has been taken which raises concerns about the seriousness of the ECHR’s approach.